Special offer: add the Sand Screw umbrella holder to this order for just $2.95 (regular price is $12.95). This offer is good only with the purchase of a beach umbrella. Please add Sand Screw one-click below. 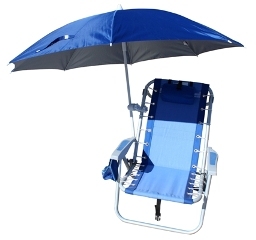 Sturdy beach umbrella clamp and sun blocking 6 foot beach umbrella combo. Chair not included. Add beach umbrella carry bag for just $4.95 below. Uses the weight of your chair as anchorage. Handy oversized carry bag for Beach Umbrellas. Sandscrew Beach Umbrella Holder Special Offer! Save $10! Secure your beach umbrella with this handy rugged holder. Holder for Beach Umbrellas . 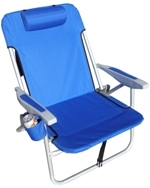 This offer good only with the purchase of our beach umbrella.